Maker’s Mark found a way to turn an absolute social media disaster to an online win. Last week, the whiskey maker announced plans to cut the amount of alcohol from 45 to 42 per cent, making it 84 instead of 90 proof, due to high demand and low bourbon supply. Suffice it to say that the internet wasn’t pleased. It’s the age of social media, so consumers were tweeting and Facebooking their complaints to anyone who would listen. realising almost immediately that it made a huge mistake — “It was quickly, after a day or two” CCO Rob Samuels explained to Drink Spirits — the brand decided to embrace the social media platforms that were bashing it so hard to deliver the message that it was sorry and reversing its decision about lowering the alcohol content. 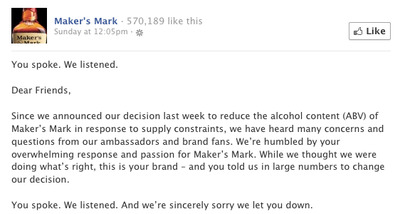 “It takes a little while to get your head wrapped around that because our feelings were hurt and our ego was hurt,” Samuels said, but less that a week later Maker’s Mark tweeted “You spoke. We listened.” with a link to its Facebook apology. The phrase then became a popular hashtag. Customers went from feeling abandoned to listened to and respected in record time, and Maker’s Mark retweeted their messages. 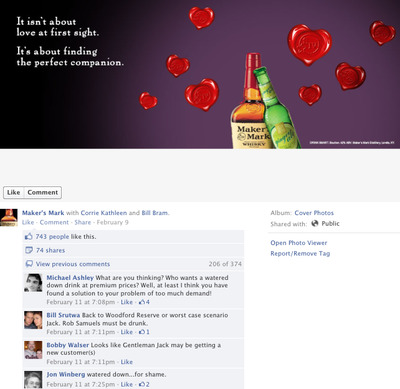 Maker’s Mark also utilized Facebook to spin the negative responses. Its apology from Samuels was released via the social network. Since Sunday, the post has been like more than 27K times, shared more than 8.5K times, and has 4.2K comments. A very active and loud social media consumer base has changed how companies do business. 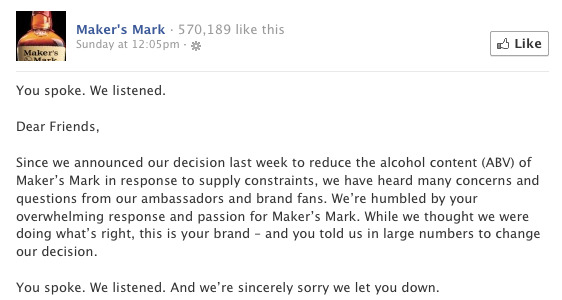 While a tiny flub can be blown up 10 fold because someone notices it on Twitter, Maker’s Mark’s response shows that, if well utilized, the very same tools can be used to help haters regain company faith.